We also had two sleep inducing matches where England won on their march to inevitable European glory/first round knockout in 2016. Last Sunday saw The Sun on Sunday with the startling revelation that Antonio Valencia is as good at delivering photographs of himself to the right place as he is delivering a cross. The most refreshing thing about the Valencia ‘scandal’ is that everybody that did see it, shrugged their shoulders seconds later. Once upon a long ago, there would’ve been titters around the workplace water cooler. There would’ve been sermons written by coke headed drunken adulterous columnist’s on Fleet Street about footballers being role models and maybe even a question raised in the Commons by an opportunist MP that nobody has ever heard of, about the moral malaise of footballers. This week, there’s been virtually nothing. I reckon most people had forgotten about it by Sunday afternoon. So after sixteen days of no club football, we were all looking forward to this match. We were confident United would come roaring out after the international break and take control of this game. It didn’t work out like that. United were on the back foot from the first minute and when Stéphane Sessègnon deservedly put West Brom in the lead in the 8th minute, United had barely touched the ball. The defending from United was as bad as to be comical. Andre Wisdom was given so much time on the right flank that I swear that he checked his watch, texted his missus and then lit up a cigarette before delivering the cross to Sessègnon. Marouane Fellaini came on for Ander Herrera at half time. Much to the amusement of the people who run West Bromwich Albion’s official twitter account. I’m not sure how amused they were two minutes into the second half when Fellaini scored his first ever goal for United. An absolute belter which was similar to Sessègnon in the first half. I was delighted for Fellaini. He’s not the best player I’ve ever seen in a United shirt but he’s nowhere near the worst either. He’s deserved a bit of luck. United took control of the game but a risible offside trap between Marcos Rojo and Rafael da Silva in the 66th minute left Saido Berahino one on one with David de Gea. Berahino scored the winner against United at Old Trafford last season. After that goal went in, he looked good for repeating his trick. Eight minutes later, a previously anonymous Robin van Persie hit the post but that was the only moment United looked dangerous until his compatriot, Daley Blind, equalised for United in the 87th minute. I think a draw was a fair result overall but, with all due to West Brom, United need to be winning games like this if they are to finish in the top four this season. United fans who travelled en masse to the Birmingham overspill deserved better than this. Having been given a relatively gentle start to the season by the fixture computer, United have yet to win away. 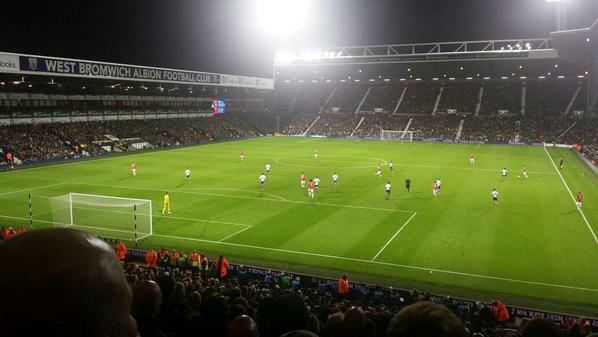 West Brom fans were singing “you’re not famous anymore” to United on fifteen minutes. That’s the now unknown team that had enticed the Baggies biggest crowd of the season to date at The Hawthorns, on a Monday night. Three of United’s next four games are against Chelsea, City and Arsenal. The attacking players United have are a match for what those sides have. The biggest difference is the defence. Having seen tonight’s match and the season in general, the thought of Diego Costa, Sergio Aguero and David Silva going up against our defence means I will be watching the next two matches through my fingers. See you at the other side. Just who is Ed Woodward talking about here? One solution for the next three or four matches, is to play with a sweeper. It would be the same formation as against baggies, but with one more player. Twelve in total. I know that some may frown on this tactic. But if say, they let us do it for the first 45 mins,it would make more even contest. But seriously, the problems United have are tactical . Therefore curable. Stick with it people.